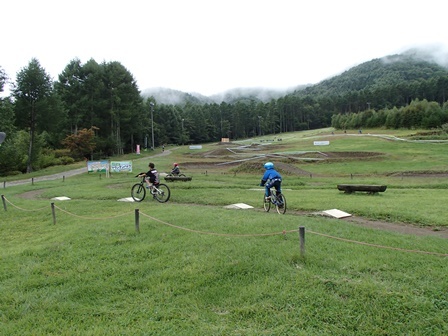 Today, I want to show you “Kids’ course at Fujimi Panorama”! Around our area, Kids love “Pump Truck” at Seizanso ! It must be fun for them to have some obstacles in their play. It’s very sunny day today in Taki but also very windy. 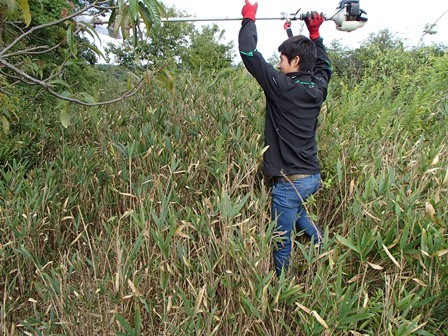 Today, I’m introducing about our “course improvement work” in these days. 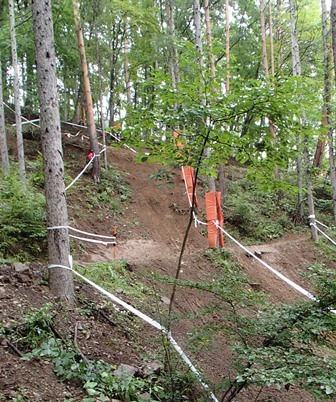 We have been working on 5km course for a few months. As you imagine, we need manpower resource on this work, so we asked for some volunteers to help us and thankfully a few boys joined us. I guess we need to hurry to complete this course as soon as possible. All of this work is done by hand and it’s really tough but we are working very hard to make it complete. 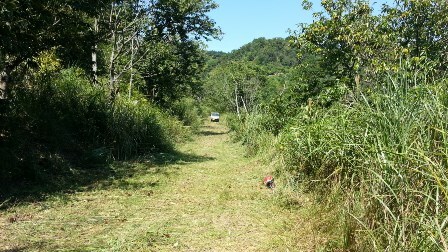 This course will be used for ” Second Seiwadai MTB race” next year!!! Continuing from yesterday, I’m giving you a report of Fujimi race. I want to introduce you this slant today. It seemed to have an angle of 45 degrees at least. I was 100% sure that if I try this course, I would definitely be injured so badly. 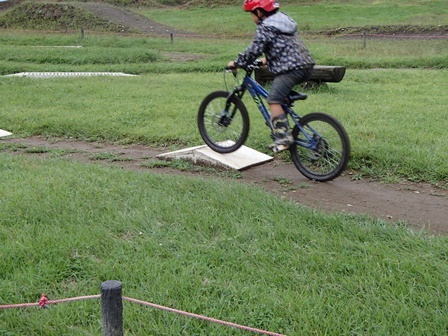 I saw Kaz leapt over an obstacle as if it were nothing. “This is the professional! !” I felt. 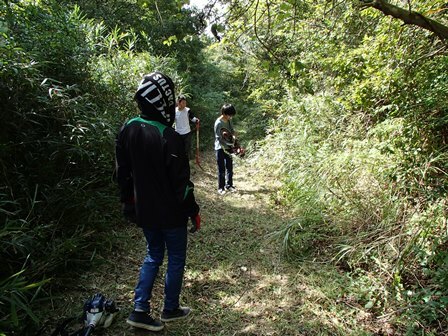 Now we want to make such a terrific point on our course- Seiwadai!! This inspection made us want to challenge more for our race next year. from TV that there are so many areas gotten huge damages all over in Japan. How was your area ?? 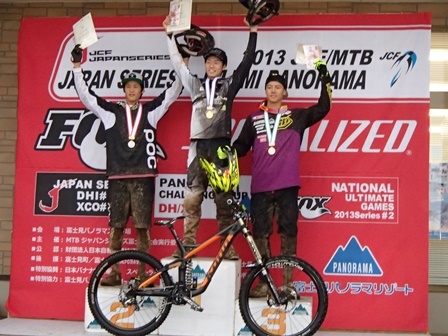 to see “JCF/MTB Japan series at Fujimi panoramic” combine cheering for Kaz. It was first time for me to see a Professional race but it was more than I expected! Well, now you must have a question how Kaz went! Of course he won !(^^)! 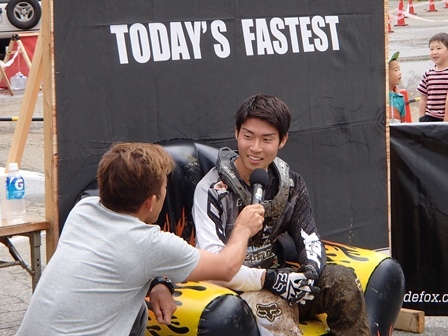 He was soooo cool when he reached a goal with the fastest time. ※This report will be serialized on this site, so please look forward to it ! 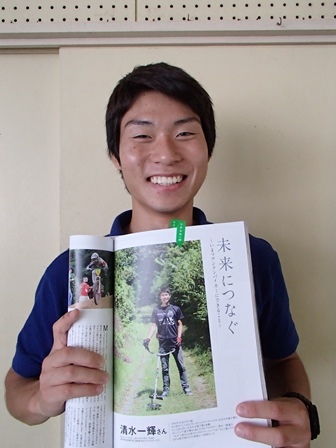 Today, I’m announcing about a public talk session from Takumi Nishii. The detail is as here below. or “I’m interested in it !” Pease come and enjoy his speaking. “2020 Tokyo Olympic” was decided!! Olympic in our own country. Now we gotta grab the chance to hold the selection race for Tokyo Olympic. Seiwadai course is expected to be able to hold the selections of several pennant races including Olympic's. 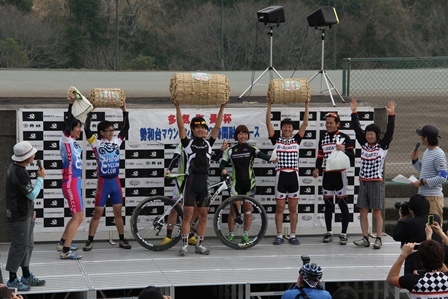 The date of “The second Seiwadai MTB Race” was finally decided. This time we will put on more power on the race, so please look forward to it. I will announce you when the entry gets started. It was very crazy weather last night here around Taki but it's too clear to be true today. I love autumn but I want this typhoon season to be gone soon. 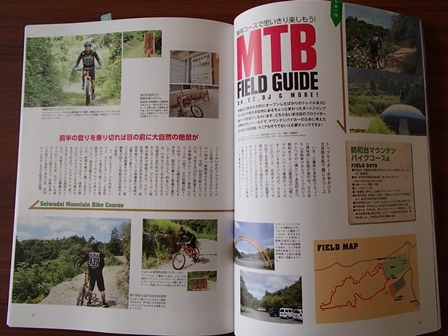 Well, today we are introducing a magazine which has pieces about Mr. Kazuki Shimizu just got back from South Africa and Seiwadai MTB course. 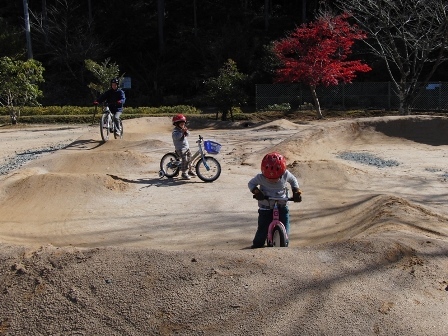 We are very happy about our piece of Seiwadai course. 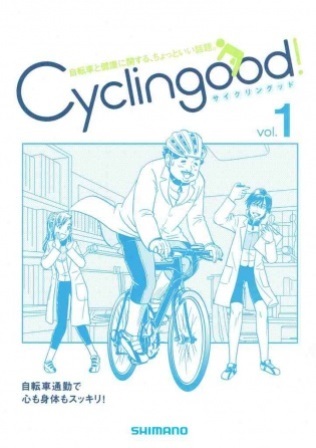 And also Mr. Shimizu has 2 pages for his own too. You can find it at book stores so please check it out ! !